Our complex, chaotic world seems to be spinning out of control. It’s easy to feel overwhelmed by just turning on the news. Fear grips many of us when we hear about the beheading of a journalist one day, and the slaughter of Christians in the Middle East the next. Demonic forces are accelerating their attacks. We can see it when ISIS dominates and terrorizes citizens in Iraq and Syria; when Hamas bombs innocent people; when police and youth in our own communities pull guns on each other, and when racially-motivated rioting erupts. Natural disasters are occurring more than ever before, and hundreds are dying from outbreaks of incurable diseases. In 2010, when I wrote my article The Whole Earth Groans with Birth Pangs, I had no idea how quickly the world could change in four short years. Romans 8:22 tells us, “For we know that the whole creation groans and suffers the pains of childbirth together until now.” Psalm 2 speaks of nations raging and the arrogance of leaders, while the Book of Jude speaks of increases in apostasy, false teaching and in-your-face disregard for the name of the Lord and His people. These are all signs of the times. Isn’t this exactly what we are seeing today? I recently heard Anne Graham Lotz and Kay Arthur on a television special both express their sense that the coming of The Lord may be sooner than many may think. And the big question is: Are we prepared? As I’ve been speaking to various leaders and in churches the last few months, God quickened my heart to reiterate and build upon my message from 2010; but to also draw from the book of Haggai to bring a message of hope. In fact, I’ve tried numerous times to finish this article that I began to write in July of this year, but just didn’t feel it was ready. Yet, I continue to hear others also feeling a very similar sense of urgency. Even since then, we continue to see an increase of human tragedy and an unleashing of horrendous acts, as well as increase of other natural and human crisis. We now hear of reports of Ebola outbreaks spreading. All these things break our hearts, bring anxiety and fear to many, and invokes much emotion. Thus, I pray the message in this article will bring not only a challenge, but an encouragement and reminder that we have a hope in the midst of the shakings and storms around us. They wanted to meet in Philadelphia because it was home to the first Supreme Court, the first federal capital before Washington, D.C., and the birthplace of the Declaration of Independence. It is in many ways the hedge waters of the nation, the place of beginnings. 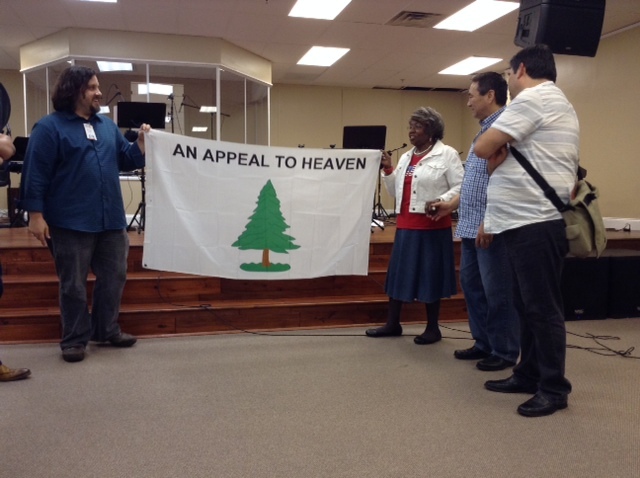 At the end of that day, dear friends and leaders from the area gave me a flag with the words, “An Appeal to Heaven.” It is a replica of the similar flags George Washington used before the United States had its own government. There was no official Navy, but Washington flew this flag on six of his ships, and it became the symbol of a people looking for freedom, knowing the only hope they had was to appeal to heaven. The flag includes a picture of an evergreen tree which was a symbol Native Americans used at the time to indicate a covenant. When tribes made a treaty, they would bury their weapons underneath an evergreen tree as a symbol of a covenant promise and treaty. To many the evergreen tree also depicts an everlasting covenant, even as Jesus hung on a tree (The Cross) as an everlasting covenant to us. Above the symbol of the Evergreen Tree was written, “An Appeal To Heaven”. Before giving me the flag, the leaders anointed it with costmary oil, now called by some people “awakening oil.” Washington’s soldiers knew that no matter how tired they were, they needed to pray; so they would take the oil and put it underneath their noses to awaken them for prayer. Sometimes, when people didn’t have the oil, they would put a costmary leaf inside their Bibles. When feeling tired and weary during a church service or time of prayer, they would pull it out and smell the leaf or nibble on it to wake themselves up. The leaders in Philadelphia also anointed my flag with the oil of love. It’s a reminder that when the world is doing crazy things, we need to be tangible expressions of God’s love. In Scripture, we see incredible stories of people like Saul who hated and killed Christians. Yet God did a work in him, and he became the author of most of our New Testament. I’ve personally seen people in other countries—including Muslim nations—whose minds were filled with hate be drawn to Christians throughout their sacrifices of love. How many Sauls are out there today who are ready to be turned into Pauls? Could it be one of your coworkers? A neighbor? That person may treat you terribly, but God is using you to be a fragrance in their lives. They may not understand it now, but God is working in their hearts, preparing them to embrace the Kingdom of God. Just think what could happen! Finally, the leaders anointed the flag with the oil of joy, because we need a restoration of the joy of the Lord, which is where we get our strength (Nehemiah 8:10). We need to be awakened, no matter how tired we are, by the spirit of God in order to have a great Revival Awakening. But we need the joy of the Lord to give us strength. In 2 Corinthians 2:14, God promised to always leads us to victory. Even when we look at the larger context of what is happening in the world, it’s just a magnification of what’s happening in each of us individually. God is concerned about the big things from a global perspective, but the little things in our lives are also important to Him. People may let us down but God never will. When he was finally released from serving Laban to return to his homeland, Jacob feared that he would have to run for his life from his brother. He came to a little place called Jabbok, which means “place of total surrender” or “to be emptied of oneself”. He left his family on one side of the river and stayed by himself on the other side, alone with God. He had no answer for all the circumstances. He didn’t have a clear idea of where he was going, and yet he was responsible for his family and figuring out where to go from here. Jacob was contending with God for the fulfillment of His promises! And he became victorious. He left that place with his hip out of place, but walking into his destiny and with the power of the Lord. God also changed his name because it was a time of new beginnings. All the things that had taken place in Jacob’s life were preparation for his future. The promise came. The process took place. And when he emptied himself, he was able to wrestle with God and to prevail. When the promise comes, it is always followed by the process, so God can prepare our hearts to walk in fullness. But He never forgets His promises. When we see the world shaking around us, we need not fear, knowing God is with us and will provide all we need when times of challenge come. But we must also be ready to play a part in God’s purpose for others. Hebrews 11 tells us that, by divine warning, Noah prepared an ark. Similarly, we need to prepare ourselves as a modern-day ark of refuge. There are so many lives that are being shaken, and people are looking for a place to find hope—the hope that lives through you and through me. In the midst of the storms of life, people should be able to run to and find refuge in the Body of Christ. That’s why it’s important that our faith is not based on the shell of an institution, but on a real and intimate relationship with the Lord. When people can see something different in our lives, they will recognize the importance of getting to know Jesus. Our life’s journey can reveal the goodness and the faithfulness of God, and thus help others find their place in the Lord. The experiences and challenges on our journey become our message, and our message becomes our ministry. As we look at the world around us, we see people living in fear: families who have only 30-45 seconds to make it to a shelter when the rocket warning blares; children and others suffering by the hands of Hamas in Gaza; believers in Iraq who are fleeing their homes to escape the brutality of ISIS. We see evil leaders in power, using children and the authentically desperate as pawns. With so much tragedy, it’s more important than ever for the church to respond as a tangible expression of Christ. When the Iraqi city of Erbil was being destroyed, I got a desperate text from one of our partner ministries working near there: “Doug, we’re staying put. The situation is so bad with everyone running from ISIS.” In less than 24 hours, we were able to send them funding to assist in getting a location to use as a place of shelter and for distribution of food. We have partners working in Syria, Jordan, Lebanon, Iraq and other places throughout the Middle East, helping Christians and others who are suffering. Here in the United States, we’ve joined with other leaders to try to bring a sense of humanity to the border crisis, while empowering churches south of the border to help keep their families intact and not to risk exposing their children to drug cartels and traffickers. God is saying not to fear because He will always lead us to victory so that we can help others—so that we can dispense or manifest the fragrance of God every place we go. From the border crisis to the wars in the Middle East, there are no easy answers. We all have different opinions about politics and how we believe things should be done. It is easy to become emotional about the accelerating crises in our world. But Psalm 89:14 says that the Kingdom of God is built on righteousness and justice. It’s not one or the other. We need to do the right thing biblically and to live holy, but at the same time we need to show compassion and justice. Joel 3: 9-14 admonishes God’s people to “beat your plowshares into swords and your pruning hooks into spears,” when the multitudes are in the valley of decision. Interestingly, these are harvesting tools being turned into weapons of battle. We know that our battle is not against flesh and blood, but against principalities, against powers and rulers of the darkness of this age, and against the spiritual hosts of wickedness. (Ephesians 6:12). Interesting also is that Micah 4:1-3, which references the end of days, talks of a time when the weapons of battle will be turned into harvesting tools; that there would be fighting no more. A precursor to this is for the Church to cease fighting amongst ourselves and work together to bring in the harvest. The spiritual warfare of Joel 3 and the need to harvest together as a precursor to Micah 4, must work together to be effective. When Nehemiah rebuilt the walls of Jerusalem, he fought for righteousness with one hand but he did the work with the other hand. Likewise we must engage in spiritual warfare, urgent prayer on the one hand, while working together to be a tangible expression of Christ for the multitudes of souls in the valley of decision on the other hand. It is a time to be prepared in spiritual battle, while also being laborers in the harvest together. We have a work to be done, and we need to hear the voice of the Heavenly Father more clearly than ever. Just like this says, every institution we’ve ever leaned on is being shaken. All around the globe, governments are being shaken, financial institutions are being shaken, even the institution of the Church—nothing is secure unless it is founded on Christ! Don’t forget this one thing! You’re part of an unshakeable kingdom! So give thanks and let us offer ourselves as living worshippers, pleasing to God with our devotion and awe of Him.